It's that time again, when we look back in shame at what we failed to accomplish from the list of New Year's resolutions we scribbled with ruddy faces last January, and compensate by planning to change even more things this year. Didn't lose 20 pounds? Let's lose 30! Didn't travel as much as you'd hoped? Look out world, this global traveler is hitting the scene in 2k18! Let me make a counter proposal: Instead of failing and then deciding to set the bar even higher, how about we go lower? That's right, this year I'm resolving to be a realist. Come Dec. 31, 2018, I'll at least be able to look back knowing I've achieved something, however mediocre, from an arbitrary list! • 2018 seems as good a year as any to grow my hair out even longer, ensuring it will dip into more soup bowls and drag through more runny egg yolks, ideally when I'm out in public. You know the old saying: Yolk in the hair is better than egg on the face! • How about being more honest and open? Hey, online dating profile, prepare to exclusively feature photos that people I barely know tagged me in on Facebook. The ones where they look poised and fabulous, but I lurk behind, eyelids half-closed, mouth somewhere between a smile and a sneeze. If you can't handle me at my double-chinned worst, you don't deserve me at my looking-up-at-the-camera-in-the-bathroom-mirror selfie best. • I will keep ending calls with friends I haven't talked to in months by telling them we should talk more often — weekly! monthly! — but not call any more often. We're really in a routine now, why ruin a good thing? • I want to one-up every jerk I hear trapping a cashier in miserable conversation when all they did was try to be polite while ringing up their stuff. "The snow/rain/heat/smoke is awful! I can't believe this weather!" they'll start. "I know!" I'll interject, "I've never seen anything like this in the last three to nine months! Who even knew it was possible? Why don't you do something about it, cashier? Why did you bring the scourge of seasons upon us, cashier? Curse your mother and her entire lineage, cashier!" 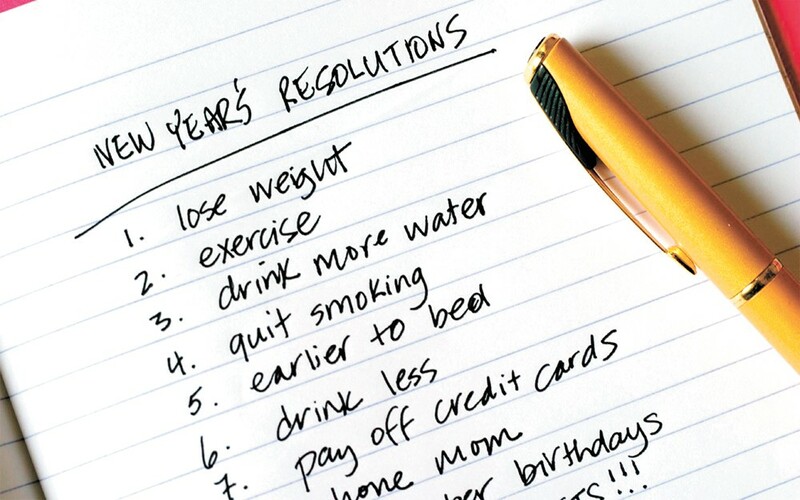 The original print version of this article was headlined "Resolutions for the Realist in All of Us"